In 1927, 30 African-Americans chartered a new Episcopal mission in the steel town of Gary, Indiana, just across the Illinois border from Chicago. Though the congregation struggled in its early years, it was strong and financially stable enough by the mid-1950s to commission its own place of worship. But a chance connection and the unexpected relationship that followed created more than just a house of God. In the '50s, Gary was a hotbed for the Great Migration. “Most of the blacks that came here were coming because they had job opportunities that they could not get in the South. And that seemed to be the group that founded St. Augustine’s,” says Paula DeBois, a member of the church. 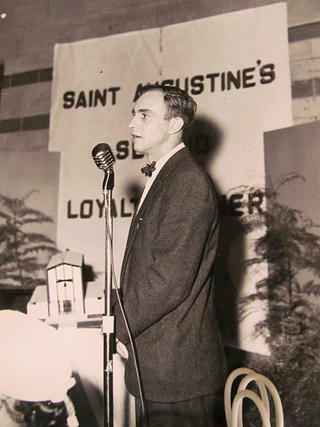 By 1955, St. Aug’s, as it’s affectionately known, was working on the purchase of a pipe organ. When the topic of building their own church came up, the organ sales rep knew just the architect for the job: the Midcentury Modernist Edward Dart. The marriage was indeed unusual at the time, but what resulted was an architectural masterpiece. Though Dart’s first design was scuttled, the two sides worked together for four years to develop their vision. True to Dart’s philosophy, the design incorporated local materials like Indiana limestone. 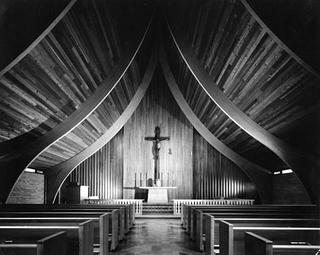 When it was completed at a cost of $120,000 in 1959 (as just Dart’s second church), it almost immediately won the AIA Citation of Merit and the Church Architectural Guild’s Honor Award. It was also featured in numerous magazines and advertisements, which DeBois is still discovering today. But even though St. Augustine’s was a media darling, the congregation didn't receive much credit. Congregants noticed that publications never used photos showing members of the church. DeBois adds that it was also unusual that the mission wasn't granted full parish status until 1961 -- two years after the building was completed. But despite the slights in earlier years, today the congregation remains strong and the church is as beautiful as ever. One of the very few alterations was the commissioning of stained-glass clerestory windows in the '70s. The rest has been preserved meticulously. “I can remember when they quibbled and squabbled over having air conditioning in there because it might mess up the wood,” says DeBois. 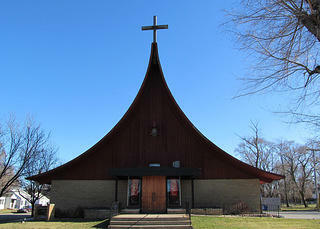 As for future preservation, the church will be included in a book by Gretchen Buggeln, a professor of art history at nearby Valparaiso University, detailing the church designs of Dart and two other architects. In addition, the congregation, which averages about 80 years of age, continues to research new ways to reach out to the community and attract new members. For her part, DeBois is about halfway through the process of getting St. Aug’s added to the National Register of Historic Places. “I think it’s a source of pride,” says DeBois of the church. “You've got several different things at play there, but yet, they all had the same vision. Once they all got on the same page, look what they could accomplish."